Buddhist art is the artistic practices that are influenced by Buddhism. It includes art media which depict Buddhas, bodhisattvas, and other entities; notable Buddhist figures, both historical and mythical; narrative scenes from the lives of all of these; mandalas and other graphic aids to practice; as well as physical objects associated with Buddhist practice, such as vajras, bells, stupas and Buddhist temple architecture. Buddhist art originated on the Indian subcontinent following the historical life of Siddhartha Gautama, 6th to 5th century BCE, and thereafter evolved by contact with other cultures as it spread throughout Asia and the world. The earliest works of Buddhist art in India date back to the 1st century BCE. The Mahabodhi Temple at Bodh Gaya became a model for similar structures in Burma and Indonesia. The frescoes at Sigiriya are said to be even older than the Ajanta Caves paintings. Chinese historical sources and mural paintings in the Tarim Basin city of Dunhuang accurately describe the travels of the explorer and ambassador Zhang Qian to Central Asia as far as Bactria around 130 BCE, and the same murals describe the Emperor Han Wudi (156-87 BCE) worshiping Buddhist statues, explaining them as "golden men brought in 120 BCE by a great Han general in his campaigns against the nomads." 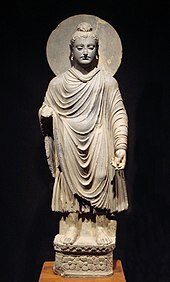 Although there is no other mention of Han Wudi worshiping the Buddha in Chinese historical literature, the murals would suggest that statues of the Buddha were already in existence during the 2nd century BCE, connecting them directly to the time of the Indo-Greeks. Anthropomorphic representations of the Buddha started to emerge from the 1st century CE in Northern India, with the Bimaran casket. The three main centers of creation have been identified as Gandhara in today’s North West Frontier Province, in Pakistan, Amaravati and the region of Mathura, in central northern India. After the overthrow of the Mauryan Empire by the Shunga Empire, the Greco-Bactrian and subsequently the Indo-Greek Kingdoms invaded north-western India. They facilitated the spread of Greco-Buddhist art style to other parts of the subcontinent. The Indo-Greek King Menander I was renown as a great patron of Buddhism, attaining the title of an arhat. Meanwhile Pushyamitra Shunga persecuted Buddhism, presumably to further erase the legacy of the Mauryan Empire. This led to the decline of Buddhist art east of Mathura. Gandharan Buddhist sculpture displays Hellenistic artistic influence in the forms of human figures and ornament. Figures were much larger than any known from India previously, and also more naturalistic, and new details included wavy hair, drapery covering both shoulders, shoes and sandals, and acanthus leaf ornament. The art of Mathura tends to be based on an Indian tradition, exemplified by the anthropomorphic representation of divinities such as the Yaksas, although in a style rather archaic compared to the later representations of the Buddha. The Mathuran school contributed clothes covering the left shoulder of thin muslin, the wheel on the palm, the lotus seat. Mathura and Gandhara also influenced each other. During their artistic florescence, the two regions were even united politically under the Kushans, both being capitals of the empire. It is still a matter of debate whether the anthropomorphic representations of Buddha was essentially a result of a local evolution of Buddhist art at Mathura, or a consequence of Greek cultural influence in Gandhara through the Greco-Buddhist syncretism. Remains of early Buddhist painting in India are vanishingly rare, with the later phases of the Ajanta Caves giving the great majority of surviving work, created over a relatively short up to about 480 CE. These are highly sophisticated works, evidently produced in a well-developed tradition, probably painting secular work in palaces as much as religious subjects. Buddhist art continued to develop in India for a few more centuries. The pink sandstone sculptures of Mathura evolved during the Gupta period (4th to 6th century CE) to reach a very high fineness of execution and delicacy in the modeling. The art of the Gupta school was extremely influential almost everywhere in the rest of Asia. At the end of the 12th century CE, Buddhism in its full glory came to be preserved only in the Himalayan regions in India. These areas, helped by their location, were in greater contact with Tibet and China - for example the art and traditions of Ladakh bear the stamp of Tibetan and Chinese influence. Buddhism arrived in China around the 1st century CE, and introduced new types of art into China, particularly in the area of statuary. Receiving this distant religion, strong Chinese traits were incorporated into Buddhist art. Tejaprabhā Buddha and the Five Planets [yue], 897 A.D.
Korean Buddhist art generally reflects an interaction between other Buddhist influences and a strongly original Korean culture. Additionally, the art of the steppes, particularly Siberian and Scythian influences, are evident in early Korean Buddhist art based on the excavation of artifacts and burial goods such as Silla royal crowns, belt buckles, daggers, and comma-shaped gogok. The style of this indigenous art was geometric, abstract and richly adorned with a characteristic "barbarian" luxury[clarify]. Although many other influences were strong, Korean Buddhist art, "bespeaks a sobriety, taste for the right tone, a sense of abstraction but also of colours that curiously enough are in line with contemporary taste" (Pierre Cambon, Arts asiatiques- Guimet'). The cultural exchange between India and Japan was not direct, as Japan received Buddhism through Korea, China, Central Asia and eventually India. The Japanese discovered Buddhism in the 6th century when missionary monks travelled to the islands together with numerous scriptures and works of art. The cultural contact between Indian Dharmic civilization and Japan through the adoption of Buddhist ideas and aesthetic has contributed to the development of a national cultural order in the subsequent century. The Buddhist religion was adopted by the state in the following century. Being geographically at the end of the Silk Road, Japan was able to preserve many aspects of Buddhism at the very time it was disappearing in India, and being suppressed in Central Asia and China. In 10th to 11th centuries, Tabo Monastery in Himachal Pradesh, Northern India (at that time part of Western Tibet Kingdom) serves an important role as an intermediary between India and Tibet cultural exchange, especially Buddhist art and philosophy. Notable example of Tibetan Buddhist art in Tabo is its exquisite frescoes. The orthodox forms of Buddhism, also known as Southern Buddhism are still practised in Sri Lanka, Myanmar (Burma), Thailand, Laos, and Cambodia. During the 1st century CE, the trade on the overland Silk Road tended to be restricted by the rise of the Parthian empire in the Middle East, an unvanquished enemy of Rome, just as Romans were becoming extremely wealthy and their demand for Asian luxury was rising. This demand revived the sea connections between the Mediterranean Sea and China, with India as the intermediary of choice. From that time, through trade connections, commercial settlements, and even political interventions, India started to strongly influence Southeast Asian countries. Trade routes linked India with southern Burma, central and southern Siam, lower Cambodia and southern Vietnam, and numerous urbanized coastal settlements were established there. From the 14th century, the main factor was the spread of Islam to the maritime areas of Southeast Asia, overrunning Malaysia, Indonesia, and most of the islands as far as the Southern Philippines. In the continental areas, Theravada Buddhism continued to expand into Burma, Laos and Cambodia. According to tradition, Buddhism was introduced in Sri Lanka in the 3rd century BCE by Indian missionaries under the guidance of Thera Mahinda, the son of the Mauryan Emperor Ashoka. Prior to the expansion of Buddhism, the indigenous population of Sri Lanka lived in an animistic world full of superstition. The assimilation and conversion of the various pre-Buddhist beliefs was a slow process. In order to gain a foothold among the rural population, Buddhism needed to assimilate the various categories of spirits and other supernatural beliefs. The earliest monastic complex was the Mahāvihāra at Anurādhapura founded by Devānampiyatissa and presented to Mahinda Thera. The Mahāvihāra became the centre of the orthodox Theravāda doctrine and its supreme position remained unchallenged until the foundation of the Abhayagiri Vihāra around BC 89 by Vaţţagāmaņĩ. Later, from the 9th to 13th centuries, the Mahayana Buddhist and Hindu Khmer Empire dominated vast parts of the Southeast Asian peninsula, and its influence was foremost in the development of Buddhist art in the region. Under the Khmer, more than 900 temples were built in Cambodia and in neighboring Thailand. The royal patronage for Khmer Buddhist art reached its new height with the patronage of Jayavarman VII, a Buddhist king that built Angkor Thom walled city, adorned with the smiling face of Lokeshvara in Angkor Thom dvaras (gates) and prasat towers Bayon. Angkor was at the center of this development, with a Buddhist temple complex and urban organization able to support around 1 million urban dwellers. A great deal of Cambodian Buddhist sculpture is preserved at Angkor; however, organized looting has had a heavy impact on many sites around the country. The Thai Buddhist art encompasses period for more than a millennia, from pre Thai culture of Dvaravati and Srivijaya, to the first Thai capital of Thai 13th century Sukhothai, all the way to succeeding Thai kingdoms of Ayutthaya and Rattanakosin. Like the rest of Southeast Asia, Indonesia seems to have been most strongly influenced by India from the 1st century CE. The islands of Sumatra and Java in western Indonesia were the seat of the empire of Sri Vijaya (8th-13th century), which came to dominate most of the area around the Southeast Asian peninsula through maritime power. 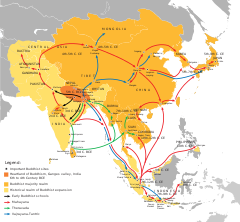 The Sri Vijayan Empire had adopted Mahayana and Vajrayana Buddhism, under a line of rulers named the Sailendra. The Sailendras was the ardent temple builder and the devoted patron of Buddhism in Java. Sri Vijaya spread Mahayana Buddhist art during its expansion into the Southeast Asian peninsula. Numerous statues of Mahayana Bodhisattvas from this period are characterized by a very strong refinement and technical sophistication, and are found throughout the region. One of the earliest Buddhist inscription in Java, the Kalasan inscription dated 778, mentioned about the construction of a temple for the goddess Tara. Extremely rich and refined architectural remains are found in Java and Sumatra. The most magnificent is the temple of Borobudur (the largest Buddhist structure in the world, built around 780-850 AD), built by Sailendras. This temple is modelled after the Buddhist concept of universe, the Mandala which counts 505 images of the seated Buddha and unique bell-shaped stupa that contains the statue of Buddha. Borobudur is adorned with long series of bas-reliefs narrated the holy Buddhist scriptures. The oldest Buddhist structure in Indonesia probably is the Batujaya stupas at Karawang, West Java, dated from around the 4th century. This temple is some plastered brick stupas. However, Buddhist art in Indonesia reach the golden era during the Sailendra dynasty rule in Java. The bas-reliefs and statues of Boddhisatva, Tara, and Kinnara found in Kalasan, Sewu, Sari, and Plaosan temple is very graceful with serene expression, While Mendut temple near Borobudur, houses the giant statue of Vairocana, Avalokitesvara, and Vajrapani. ^ "What is Buddhist Art?". Buddhist Art News. Retrieved 27 January 2014. ^ "(In the Milindapanha) Menander is declared an arhat", McEvilley, p. 378. ^ Weidner, Marsha Smith, and Patricia Ann Berger. Latter Days of the Law : Images of Chinese Buddhism, 850-1850. Lawrence, KS: Spencer Museum of Art, University of Kansas, 1994. ^ Berger, Patricia Ann. Empire of Emptiness : Buddhist Art and Political Authority In Qing China. Honolulu: University of Hawai'i Press, 2003. ^ "Crown". Arts of Korea. The Metropolitan Museum of Art. Retrieved 9 January 2007. ^ Grayson (2002), p. 21. ^ a b Grayson (2002), p. 25. ^ Grayson (2002), p. 24. ^ Peter N. Stearns & William Leonard Langer (2001). The Encyclopedia of World History: ancient, medieval, and modern, chronologically arranged. Houghton Mifflin Books. ISBN 0-395-65237-5. ; "Korea, 500–1000 A.D." Timeline of Arts History. The Metropolitan Museum of Art. Retrieved 9 January 2007. ^ Grayson (2002), pp. 27 & 33. ^ "Korean Buddhist Sculpture, 5th–9th Century". Timeline of Arts History. The Metropolitan Museum of Art. Retrieved 9 January 2007. ^ "Korean Buddhist Sculpture (5th–9th century) | Thematic Essay | Heilbrunn Timeline of Art History | The Metropolitan Museum of Art". metmuseum.org. Retrieved 11 December 2014. ^ "Japanese Art and Its Korean Secret". www2.kenyon.edu. Retrieved 11 December 2014. ^ Fletcher, B.; Cruickshank, D. (1996). Sir Banister Fletcher's a History of Architecture. Architectural Press. p. 716. ISBN 9780750622677. Retrieved 12 December 2014. ^ Grayson, J.H. (2002). Korea: A Religious History. RoutledgeCurzon. p. 33. ISBN 9780700716050. Retrieved 11 December 2014. ^ Sampa Biswas (2010). Indian Influence on the Art of Japan. Northern Book Centre. ISBN 9788172112691. ^ Deborah E. Klimburg-Salter; Christian Luczanits (1997). Tabo: a lamp for the kingdom : early Indo Tibetan Buddhist art in the western Himalaya, Archeologia, arte primitiva e orientale. Skira. ^ a b T. Richard Blurton (1994), Hindu Art, Harvard University Press, ISBN 978-0674391895, pages 202-204, Quote: "Buddhism flourished in this part of India throughout the first millennium AD, especially under the patronage of Pala kings of the eighth and twelfth centuries. Towards the end of this period, popular Buddhism and Hinduism became increasingly intermeshed. However, when Muslim invaders from further west sacked the monasteries in the twelfth century, Buddhism collapsed as a major force in India." ^ von Schroeder, Ulrich. 1990. Buddhist Sculptures of Sri Lanka. First comprehensive monograph on the stylistic and iconographic development of the Buddhist sculptures of Sri Lanka. 752 pages with 1620 illustrations (20 colour and 1445 half-tone illustrations; 144 drawings and 5 maps. (Hong Kong: Visual Dharma Publications, Ltd.). von Schroeder, Ulrich. 1992. The Golden Age of Sculpture in Sri Lanka - Masterpieces of Buddhist and Hindu Bronzes from Museums in Sri Lanka, [catalogue of the exhibition held at the Arthur M. Sackler Gallery, Washington, D. C., 1 November 1992 – 26 September 1993]. (Hong Kong: Visual Dharma Publications, Ltd.). ^ "The Post Pagan Period - Part 1". seasite.niu.edu. Retrieved 11 December 2014. ^ "The Post Pagan Period - Part 3". seasite.niu.edu. Retrieved 11 December 2014. ^ "buddhaartgallery.com". buddhaartgallery.com. Retrieved 11 December 2014. ^ W. Vivian De Thabrew (2014). Buddhist Monuments and Temples of Cambodia and Laos. Author House. p. 33. ISBN 9781496998972. ^ a b c Dawn F. Rooney (2016). Thai Buddhist Art: Discover Thai Art. River Books. ISBN 9786167339696. ^ a b c Jean Philippe Vogel; Adriaan Jacob Barnouw (1936). Buddhist Art in India, Ceylon, and Java. Asian Educational Services. pp. 90–92. ISBN 9788120612259. ^ John Miksic (2012). Borobudur: Golden Tales of the Buddhas. Tuttle Publishing. ISBN 9781462909100. ^ "Prajnaparamita". Virtual Collections of Asian Masterpieces. Retrieved 27 August 2017. ^ Lokabandhu. "Triratna Buddhist Community News: Report from 'Buddha Mind - Creative Mind?' conference". fwbo-news.blogspot.com. Retrieved 11 December 2014. ^ "Dharma Arts Network - Launched at Buddha Mind - Creative Mind ?". dharmaarts.ning.com. Archived from the original on 10 October 2010. Retrieved 11 December 2014.